Beautiful, cosy, comfortable residence "this property", 800 m a.s.l.. In the hamlet Carisolo, in the resort 1.3 km from the centre of Pinzolo, in a quiet, sunny position, 500 m from the skiing area. For shared use: park 10'000 m2. In the house: internet access, lift, storage room for bicycles, storage room for skis, central heating system, ski boot dryer. Communal covered parking. Shop, grocery 200 m, restaurant 50 m, indoor swimming pool 9 km, thermal baths "Terme di Comano" 31 km. Golf course 5 km, tennis 1 km, chair lift 500 m, ski bus stop 100 m, ski school 900 m, ice field 1 km. 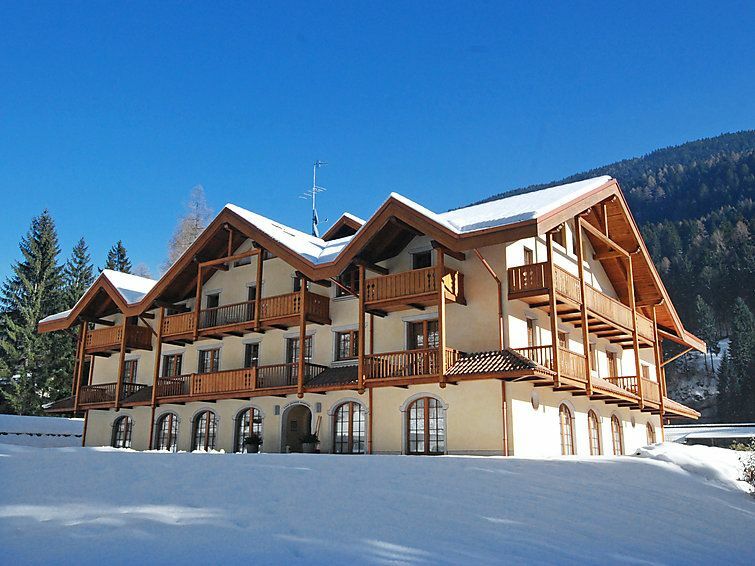 Nearby attractions: Madonna di Campiglio 13 km. Please note: the photograph shows a typical example. There are more similar properties for rent in this same residence. 3-room apartment 60 m2. Beautiful and cosy furnishings: living/dining room with 1 sofabed and satellite TV. Exit to the balcony. 1 room with 2 beds. 1 room with 2 beds. Kitchenette (2 hot plates, microwave, freezer). 2 showers/bidet/WC. Parquet floors. Balcony 10 m2. Beautiful view of the mountains. Garage. 1 pet/ dog allowed.